The British Championships take place from 28th July down in Torquay, and Northants are going to be well represented with at least 9 players taking part in the Junior sections this year. Currently those players that we know are taking part are Max Miller, Kishan Modi, Shyam Modi (all in the under 10 section) Pacey and Tyler Gwynne (under 11) Eva Ressel (under 13) and also Harry Bowman, Sam Herring and Owen Robinson (under 14 section) Sam will be extra busy as he is also going to be playing in the under 180 grade section as well! The NSCA would like to wish all these players the very best of luck when they mix it with the best junior players from across the country. If you know of anyone else making the long trip down to Devon then do let us know. We will be keeping an eye as to how all these players progress, and will keep you up to date with how they all do during the two week event. The official website for the British Championships can be found here. There was a wonderful turnout by Northants and Northants associated players for the 2013 Northern Gigafinal held in Manchester. With well over 25 players making the journey, of these 7 succeeded in qualifying for the Challengers section of the Terafinal which takes place in Loughborough during the weekend of 17th/18th August, whilst a further 9 qualified for the Silver Plate (North) which is to be held in Heanor on 14th September. Many congratulations to every player that took part in this tournament, and good luck to those players who will be playing in one or other of these two further competitions. Meanwhile, details of the Terafinal can be found via the UK Chess Challenge website here, and details of the Plate competitions can be found via the UK Chess Academy website here. The NSCA sent an under 13 team to the recent ECF County Championships, and came away as the winners of the Minor section, defeating 17 other county teams that entered. Many congratulations to the team who represented Northants so well. 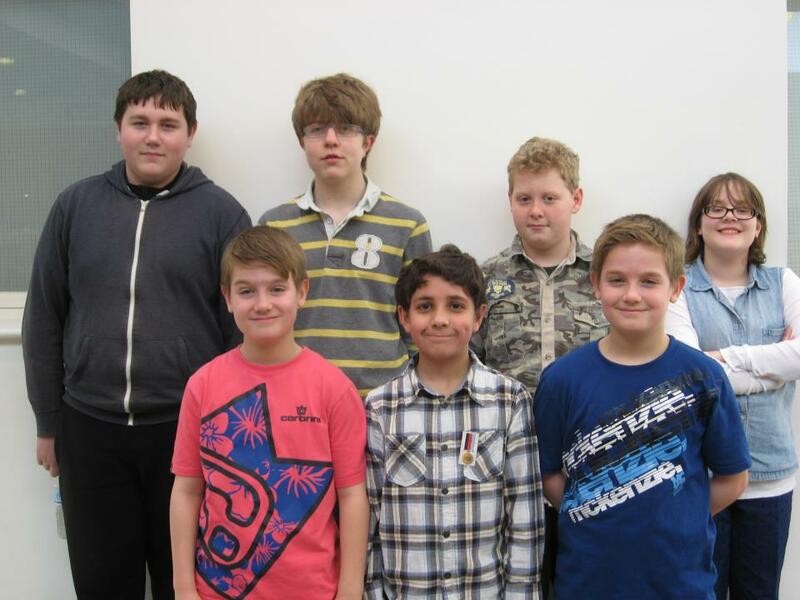 A team of six players from the NSCA travelled to Haberdashers' Aske's Boys' School near Elstree in Hertfordshire on Sunday, 30th June, to take part in the Under 13 Minor section of the English Chess Federation County Championships. Only Board 1, David Collyer, had played in this tournament previously – a new experience for the other five taking part - the youngest member of the team being 10 years of age, the eldest 13. The tournament consisted of three rounds with 30 minutes on the clock for each player plus a ten second increment added per move. There were a total of eighteen teams including Northamptonshire competing in the section with a number of counties entering two teams and in the case of the hosts, Hertfordshire, three teams. Northamptonshire started well, winning 5 out of their 6 games in Round 1, putting them in second equal place, with Sussex winning the full quota. In Round 2 the County repeated this scoreline bringing the running total up to 10 points - enabling them to edge into a slender lead with Sussex hot on their heels with 9.5 points and Hertfordshire just behind them on 9 points. David Eustace, the ECF Arbiter for the day, announced the scores just prior to the beginning of Round 3, commenting that “It was very tight at the top” - a situation the NSCA team were only too aware! Round 3 was a tense affair from the off – however, Connor Arthurs managed to chalk up a speedy win against his Buckinghamshire opponent. Ryan Reed finished next with a convincing win over neighbouring county Leicestershire. Play continued for some time after this, with David Collyer, Harry Bowman, Pacey Gwynne and Tyler Gwynne all locked in closely contested games. Harry Bowman was next to break through with a win over the Essex Board 2, followed by David Collyer calling checkmate over the Lincolnshire Board 1. Tyler Gwynne agreed a useful draw against Essex whilst his twin brother, Pacey, completed the frame by recording a win against his opponent from little known rivals Hampshire. All the results from all the sections can be found here. Whilst the under 13s were winning in Hertfordshire, just a bit further down the road Max Miller was winning in Barnet! He took part in the training day and tournament organised by British Master Rob Willmoth which included coaching by International Master Lorin D'Costa as well. In the last round he drew with Harrison Willmoth (an under 12 and the organisers son) and so they shared the prize money, but after a 5 minute play off between the two Max came out on top and so claimed the Trophy for first place. Many congratulations to Max on this and his season long high performance. There was a tremendous turn out for our last tournament of the season, our SSAFA competition, with well over 90 players taking part. Being the last competition of the season, it was also the last section of the season long Grand Prix, meaning there were twice as many prizes to present as normal! 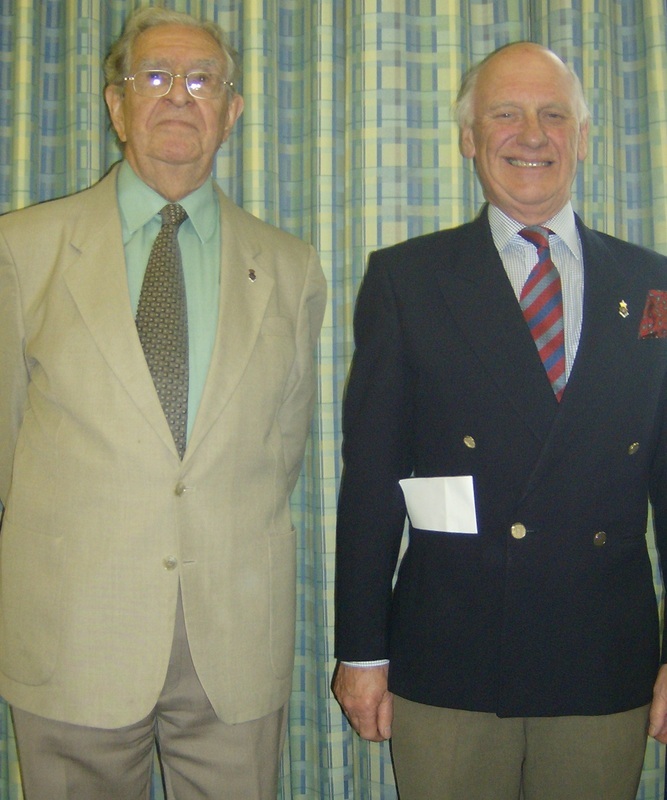 Many thanks to both David Youngs and Col. John Royle MBE from SSAFA who made these presentations. All the money raised from this tournament goes directly to SSAFA, who have been our chosen charity for over 20 years. You can find out all about the wonderful work they do by visiting their website here. All the winners of the 2013 SSAFA tournament can now be seen here, whilst the 2013 Grand Prix winners can be seen here. The AGM of the NSCA has been put back slightly to July 16th. It will still take place from 7.30pm at the Overstone Manor near Sywell, and everybody is very welcome to attend. If you would like to have some input into how the NSCA is run, or if you would like to take a more active roll in the NSCA please do feel free to come along - we would love to see you all there. If you can't make it, but do have some issues that you would like added to the agenda please feel free to contact one of the NSCA officials, or you can email us via the Contact Us page on this website. If you could submit any items before July 2nd please, thank you. A number of Northants players have already organised their entry into the Junior section of this years British Championships. These will be the 100th Championships and are taking place this year on the English Riviera, down in Torquay. If you would like to find out more details, and indeed perhaps enter yourself, then visit the Championships website here. Unfortunately the NCA Cole Trophy competition due to take place June 8th/9th has had to be cancelled. Those of you who were due to take part should all have heard from the organisers by now, and will probably know that sadly this was due to the low numbers that had entered. A group of under 13 players travelled to take part in a friendly match against a team from our neighbours Leicestershire on the Saturday of the Bank Holiday weekend - details of how the team faired will appear shortly. Sam Herring followed up his success at the Megafinal by taking part in, and winning, the Major section of the Potter Bar Congress, which took place over the bank Holiday weekend. Sam's win in the under 160 grade section included a round 3 defeat of Tim Herring - Sam's Dad! Scores and crosstables for all sections can be found here. There was a tremendous turnout for the Rockingham Megafinal in Northampton this year, with over 140 children competing at all ages from Under 7 to Under 18, and everything in between! A good number of players also scored the 4 points required to qualify for the next section of this nationwide competition, the Northern Gigafinal, which takes place in Manchester over the weekend of July 13th/14th. The champions in each section (The Supremos and Supremas) can be viewed on the results page here. Whilst all the scores and qualifiers can be viewed via the UK Chess Challenge website here. "Thank you so much for a superb megafinal yesterday - I liked the changes you'd made re the certificates and rosettes. My daughter really enjoyed herself - she was literally racing into the hall for each game and on such a high afterwards - was buzzing all the way back about the games she'd played, the moves she'd made bless her. Please pass on my thanks to everyone who made it such a great event"
A number of Northants players, including Max Miller (left) along with the NSCA Chairman, John Warren, and a number of parents were interviewed recently by the Northampton Chronicle & Echo. To read the full article you can visit their web page here. Under 13's match vs Leicestershire - interested? Interested? Please contact David Knight, Under 13s Team Manager. Details below. The Northants Under 11 team made the trip up to Nottingham to take their place in the top 18 teams in the country, and indeed everybody gave their best amongst what was a very high standard of players. The eventual winners were the team from Sussex, who scored an outstanding 51.5 points out of a possible 60, whilst Northants finished in a very creditable 14th place overall. Max Miller scored a brilliant 3 out of 3, but every player was integral to how well we did, and they can all be very proud of the performance they gave for Northants. The final scores and positions were as follows, and full complete details for each team and player can be found here. Here in Northants, we will be hosting the Rockingham Megafinal on May 18th, but over the border in Lincolnshire they have already had theirs, and Luke Tooth scored an impressive 5 out of 6 to book an early place in this year's Northern Gigafinal. Luke attends school just over the border, and hence he played in the Lincolnshire Megafinal instead, but he plays for Northants, and indeed will be doing so again on May 11th as our under 11 team will be travelling to Nottingham to play in the National Finals which take place there this year. All the Megafinal results can be accessed as and when they are put online, via the UK Chess Challenge site here. Meanwhile we will update you as to how the under 11 team get on playing the best teams in the country as soon as the results come in. Every year, players who have performed well in certain competitions nationally during the season and/or have played board 1 for their county, take part in a two day trial to attempt to qualify for the England Junior Squad. Naturally, the level of competition in this trial is extremely high. Our own David Collyer gave an admirable performance, scoring 3 out of 6, and although this was not quite enough to qualify for the squad at present, many congratulations to David on representing Northants so well. Further details of the results of the trial will follow when they become available. In the meantime however, if you would like to know which competitions you need to play well in, in order to make the trial, please feel free to ask one of the NSCA officials, or alternatively all the details can be found on the EPSCA website here. Older players can also qualify for the England Junior Squad, and again feel free to ask an NSCA official for details, or alternatively visit the website of the National Chess Junior Squad here. Many congratulations must go to Eva Ressel, who through her constant and high level results throughout the season has become the 13 year old girls champion in the English Youth Chess Championships. As well as prize money, this qualifies Eva to again play in either the European Youth Chess Championships which will take place in Moldova, or the World Youth Chess Championships taking place in the United Arab Emirates - what a choice to have to make! Well done Eva, and lots of good luck from the NSCA should you manage to get to either of these championships. You can find out more about the English Youth Chess Championships, and how to attempt to qualify to play for England, here. It was a busy weekend for some players, with the two day Nottingham Congress, and the one day Cambridgeshire Rapidplay both taking place just outside the county. Sam Herring and Owen Robinson both played in Nottingham in the Major section, with Sam scoring 2 out of 5, and Owen 1.5. Well done to both players in what was a tough competition. Well done also to those who played in Peterborough - Eva Ressel, Luke Tooth, and Max Miller. Particular congratulations go to both Eva and Max, who each scored 4 out of 5 in the Challengers section, and with it joint second place and a share of the prize money, with Eva also winning the under 14 prize, and Max the under 11 prize - a wonderful result. Whilst Sam was playing in St Albans, a number of Northants players took the chance to qualify for this year's Rockingham Megafinal via the last chance saloon. This in particular helps players who otherwise wouldn't get the chance to enter due to their school not taking part in the UK Chess Challenge, and so a good few more local players will now be able to play in our local Megafinal taking place in Northampton on May 18th. All those eligible to play via this and their schools competitions should now have received their entry forms, but you need to make sure they get sent it so please, don't forget! Two players from Northants travelled south last weekend to take part in the Major section of this competition - and they both had the same surname. Sam Herring continued his good form, by scoring 3.5 out of 5. The other player from the Herring household was his father Tim! On this occasion Sam came out on top, with Tim scoring 2 out of 5. Well done to both players. The cross tables for this competition can be found here. Only a few days after his great performance in the Junior Squad Championships, Max Miller travelled down to Berkshire, to take part in their Junior Congress in Maidenhead. This time Max had even greater success, dropping just half a point and finishing on 6.5 out of 7 to win the Under 9 section of the tournament. Many congratulations to Max on a very successful few days. More details will shortly be available here. In previous years local players have had to make quite long trips to this competition, from Liverpool, to Wolverhampton, to Kingston-Upon-Thames. But this year we were lucky enough to have this tournament held locally, in Daventry. A number of Northants players made the short trip to the west of the county, taking part in three of the four sections. Max Miller secured joint 4th place in the under 10 section, with a great score of 3.5 out of 5. This success was also followed up by his father David Miller, who won the Grand National sweepstake that was organised between the Northants contingent! In the under 12 section David Collyer beat Pacey Gwynne in the last round to finish on 2, with both Pacey and Tyler Gwynne scoring 1. Well done to everybody for representing Northants so well - let's hope this competition will again be close to home next year. The results from all of the zonal qualifying events for the National under 11 final can now be viewed online. They include details of every opponent and every result for each player, so have a look through the lists here. Northants qualify for the national finals! Many congratulations to the Northants under 11 team who, through finishing joint 5th in the Midlands & East zonal competition of the EPSCA Inter-Association Championships, have qualified for the finals which take place in Nottingham in May. Everybody played their part, and well done to all, but a special mention to both Aidan Lowrie, who scored 3 out of 3, and to Jordi Weingard, who scored 2.5. Also, well done to Pacey Gwynne, who managed to inflict a rare defeat on a member of the exceptionally strong Barnet team. 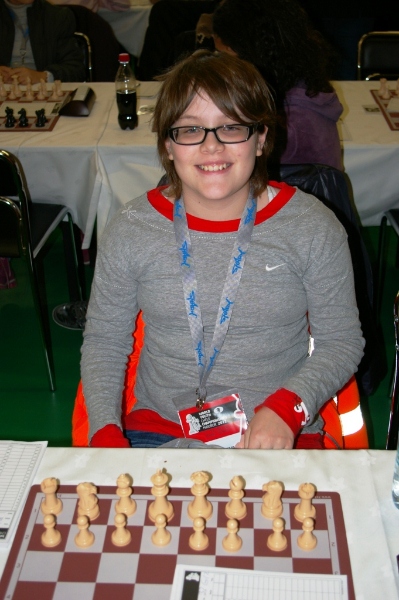 Eva Ressel travelled down to High Wycombe to take part in the latest e2e4 Congress, and despite being the lowest graded player in her section she scored a very impressive 2.5 out of 5, finishing in joint 14th out of 53 players! Well done to Eva on another great result. Details of the event and the cross-tables can be found here. Two teams from Northants made the trip up to Nottingham to take part in this year's Midlands Championships. As ever, Nottingham themselves put out some very strong teams, but Northants played well and proudly finished in second place in both the Under 9 and Under 11 sections. Well done to all those taking part, and especially to those players for whom this was their first taste of a county match. The Under 11s will be experiencing more county action very soon, when they play in this year's Midlands & East zonal competition, attempting to qualify for the national finals. We will keep you posted as to how they do. For a change, James Kearney did not have to cross the border into Northants, but instead Sam Herring made the journey in the reverse direction, as both players took part in the Under 145 grade section of the Warwickshire Open Chess Championships. Both players had a very good weekend, with Sam jointly winning the section with a score of 4 out of 5, and James taking the junior prize, just a point behind. A very well done and many congratulations to both players. This prestigious event takes place every year in its usual mid February slot down in Swindon. Northants were once again well represented, with seven players making the journey, and all scoring well. In the under 14 section Sam and James both scored 3 out of 5, whilst Owen and Eva both scored 2.5. Meanwhile in the younger sections Max and Pacey both scored 4 out of 6, and Tyler 3, with that score for Max giving him joint 3rd place in the under 9 section. All the winners can be viewed here, the cross-tables can be viewed here, and photos here. Many congratulations to Luke Tooth who, after his second place in the under 11 section of our own Junior County Championships, went one place better by winning the same section at the recent South Lincolnshire Individual Championships, which took place at Stamford Junior School, with a score of 5.5 out of 6. 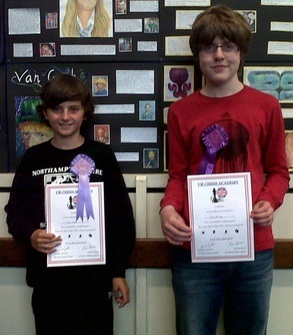 Well done to Joseph Meisner, who came joint second in the Junior section of the Peterborough Rapidplay Championships. The overall winner was a previous NSCA squad member from a few years ago, Mathavan Sriemevan, so congratulations to both players. The cross tables for this event can be found via the website here. 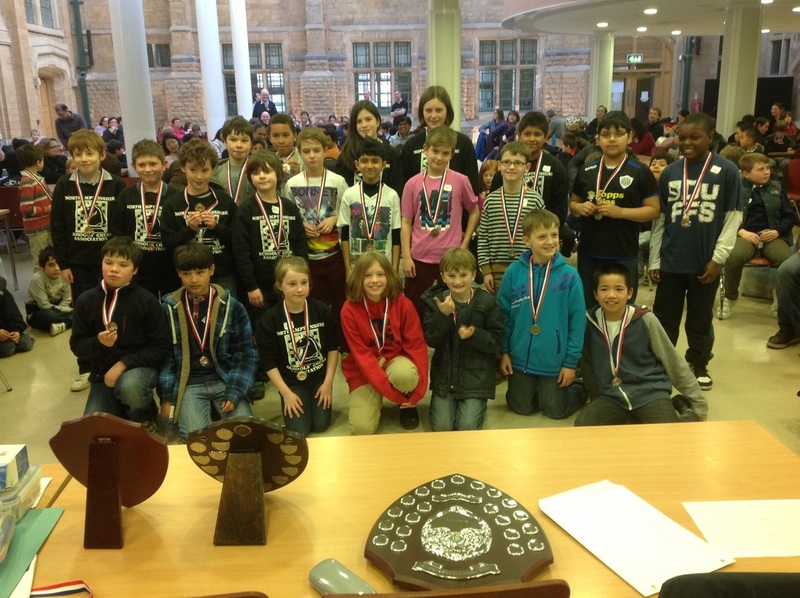 The Rapidplay Championships of the English Primary School Chess Association had to be postponed back in January due to the bad weather. However this tournament, which is also an England Under 11 Team Trial qualifying event, has now been rescheduled for 13th April. With three of the four tournaments now having taken place, the individual and schools sections of this year's Grand Prix have been updated and can be viewed here. Whilst all the County Champions were being decided, Eva Ressel was unable to attend and defend her title this year, as she was playing in the Open Norwegian Girls Championships, which took place on the island of Askoy, close to Bergen. It was well worth the trip though as, like our County winners, she also scored a perfect 6 out of 6, and so came away the overall winner in her section - many congratulations Eva on another wonderful performance. There were some rather substantial differences compared to our Championships however, such as the rest/accommodation facilities - all the competitors and parents slept on classroom floors - all very Scandinavian!! You can see the detailed final scores in her section here (go to "Group Lilliputt") and you can find out much more about the whole Championships here. A full write up with photos can also be viewed on the ECF website here. This year's individual county champions were crowned when the Junior Championships took place at Malcolm Arnold Academy on Saturday 2nd February. There was a good turn out, and some really excellent chess was played in all age groups. There was no doubting the overall winners in each section though, with Owen Robinson (under 18) David Collyer (under 11) and Max Miller (under 9) all scoring a perfect six out of six! The details of all the winners and runner-ups can be found here. This tournament was also the third part of this season's NSCA Grand Prix, and the updated overall positions with one competition left to play will be posted very soon. Regrettably it is looking increasingly likely that the County Squad training due to take place on Saturday 23rd February is going to have to be postponed. We realise that this is not ideal, especially as the training that was due to take place in January had to be cancelled due to the weather situation. We will keep you posted as to what arrangements may be made in its place, and all members of the squad will be contacted directly in due course. Many apologies for this postponement. Final cross-tables can be found by navigating from the following webpage, here. The ECF Grading database has now been updated, so to find out how much you have improved by type in your details here. Despite the atrocious weather over the weekend of 19/20 January, Max Miller travelled down the M1 to take part in the Barnet Junior Chess Championships. His journey proved well worth it, scoring a very creditable 4 out of 6 in the Under 9 section to finish joint 10th out of 63 players. The cross table for this section can be found here. 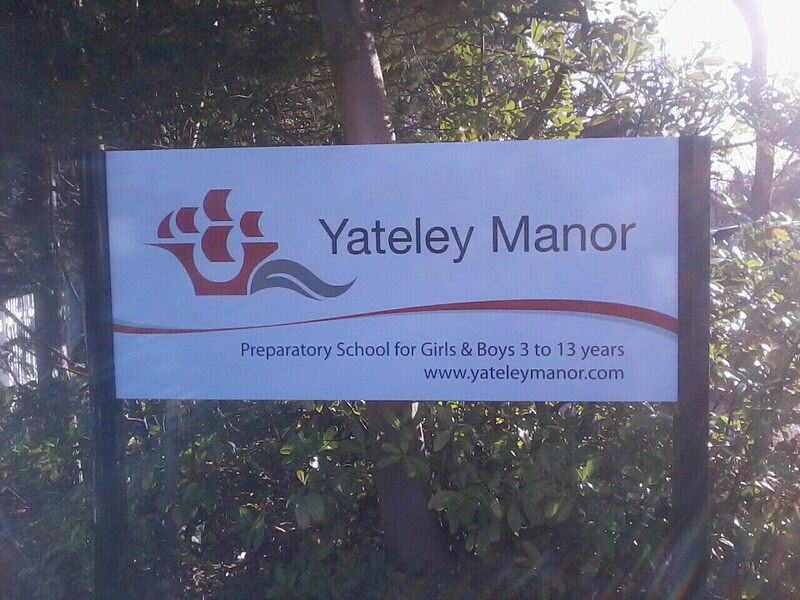 Let's hope the weather for the next weekend allows play to commence down at Yateley Manor where a number of Northants players will be taking part in the South of England Junior Championships - we will keep you posted as to how everybody gets on - good luck to all! We understand that the EPSCA Rapidplay Championships due to take place in Liverpool have also now been cancelled. Due to the inclement weather, both the NSCA training day and the NCA Cole Trophy competition have been cancelled - all those concerned have been contacted, and we will let you know if and when rearranged dates for both of these become available. There's a few things going on over the weekend of 19th/20th January. For the County Squad there is a training day on the Saturday, whilst on the same day it is the EPSCA Rapidplay Championships up in Liverpool. Also the Saturday is the first day of the Cole Trophy - this is the Northants Adult Chess Championships, which a number of the best Junior players also compete in. This is a two day tournament taking place this time in Great Doddington. Whilst Sunday is day two of the Cole Trophy, some players may decide to enter this season's Barnet Junior Championships, and the following weekend also see the South of England Championships at Yateley Manor, which is one of the England Squad qualifying events. For further details and entry forms go to the calendar page, where you can also see exactly what is happening for Juniors locally and further away. Whichever of these events you may or may not be taking part in, all the best of luck to anybody playing competitively, and we will try and keep you posted of how NSCA players perform, wherever they are playing. The 9th Northants Christmas Congress took place at Ruskin Junior School in Wellingborough, allowing us all a bit of chess on the Saturday between Christmas and the New Year. Yet again the number of entrants was again up on the previous year - indeed the Under 14 section was larger than at the Junior Congress back in November, with a high number of quality players present. The results of all the sections at the Christmas Congress can now be viewed here. This event again formed the second part of the NSCA Grand Prix, and so the leader boards have now been updated, and can be seen here. More players made the trip down to London, this time to participate in the second weekend of this season's London Junior Chess Championships. Ryan Reed and David Collyer were both in the Under 12 Major section, and unfortunately ended up playing each other in the penultimate round. Ryan came away the victor in that game, and so ended up on 4 points, with David just half a point behind. Another Under 12 player who made the trip was Myles Collymore, who came away with 3 points in the Minor section. Meanwhile, in the younger Under 8 section, Nicholas Lees scored a very good 3 points, with William Caskey just a point behind. Well done to these, and to all the Northants players who have taken part in the LJCC this year. For a full list of results and cross tables you can find them all on the LJCC website here. The rearranged Cole Trophy (The Northants Adult Chess Championships) is now due to take place on the weekend of 19th - 20th January 2013. The entry form for this can now be downloaded here. 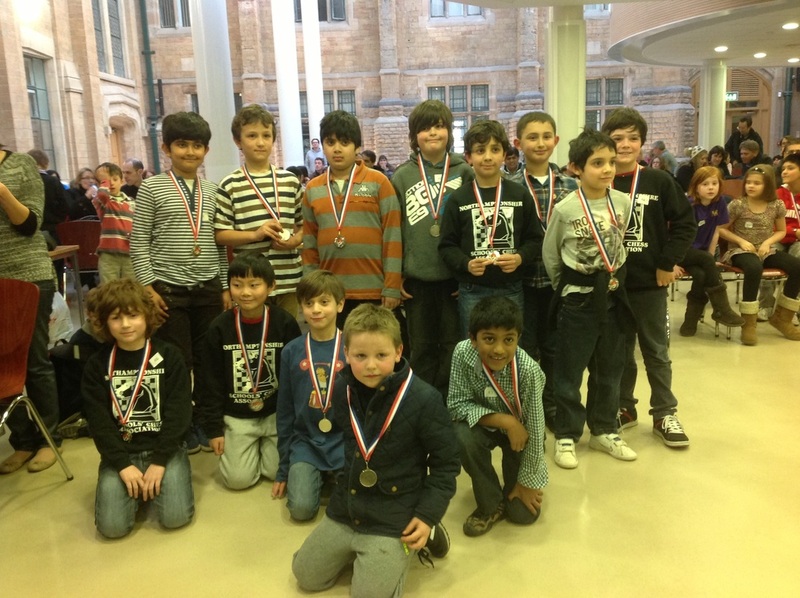 The Under 10 and Under 14 sections of this year's London Junior Chess Championships were again first up, with quite a few players from Northants making the journey down to Harrow in North London to take part. Meanwhile, in the Under 10 Minor section, our top scorer was Thomas Caskey with 5 out of 7, and also in this section was Reece Patel (3.5) and Zane Haroon. In the Under 14 Major section Sam Herring scored 3.5 out of 6, and James Kearney 2, whilst in the Under 14 Minor Harvey Craddock scored 1.5. Well done to all these players for first of all making the championships, and then for representing Northants so well - congratulations to all of you. All these scores, along with the relevant cross-tables, can now be viewed here. After Christmas it will be the turn of the Under 8s, the Under 12s, and the older sections for those over 14 years of age. We will keep you posted as to how all the Northants players fair in those sections. Two players from Northants recently travelled down to the London Chess Classic at the Olympia Conference Centre in Kensington. This competition attracts some of the best players from around the world, and so famous chess faces could be seen in abundance. The two "famous" Northants faces that could be seen there were Max Miller and Sam Herring! 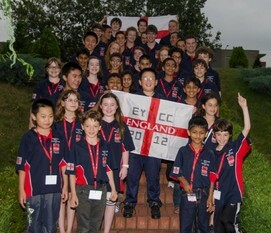 Max played in the 3rd English Junior Rapidplay. This is for all ages combined, so Max did really well by finishing with 3 out of 6. Meanwhile Sam Herring also scored 3 out of 6, in the adult under 145 graded Rapidplay. Not content with that Sam also played in an evening blitz competition, including one game against the Grand Master Jonathan Emms! Well done to Max and Sam - a real experience for both these players. You can see their respective cross tables here, and here. You can now get you entries in for this years seasonal event, which takes place on 29th December, and which again forms the second part of the NSCA Grand Prix. You can download an entry form here. This event takes place every December, pitting teams from Scotland, Wales, The North, and The Midlands against each other in three different age groups - Under 16, Under 14, and Under 12. The NSCA was very proud to be represented so well within the Midlands team this year, with Ryan Reed and David Collyer playing in the under 12 section, Sam Herring, Owen Robinson, and Eva Ressel in the under 14 section (along with James Kearney from nearby Rugby!) 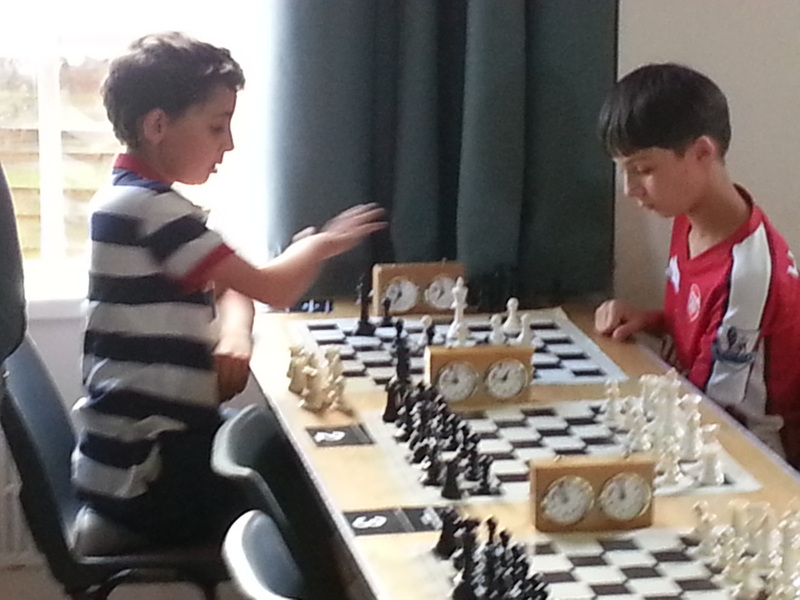 and then Marcus Rose and Harry Bowman in the under 16 section - Marcus playing on the top board. The NSCA would like to pass on many congratulations to Sam Herring who, through his fine performance in this years British Rapidplay Championships, succeeded in obtaining his second half norm, meaning he has now been invited to become a member of the England Junior Chess Squad. Finishing with a brilliant 7.5 out of 11, and only one point behind the winner in the Intermediate section, Sam finished in joint 5th place out of 58 entrants. The cross tables for this section can be found here, and details of all the results from the championships can be found here. For details of how to qualify for the England Squad yourself, you can find information here, and here. Or you can also ask any members of the NSCA who will be very happy to explain the selection policy fully. The first list of leaders in this season's Grand Prix are now available to view here. Now that the Northants Junior Congress has been and gone the new squad for this season will start to take shape - those players either keeping their place or gaining a place for the first time should all receive their invites during the next week, so keep an eye out for an email that might be arriving in your inbox sometime soon! Sadly, due to an extremely low number of entrants, the John Robinson Rapidplay which was due to take place on Saturday 24th November has had to be cancelled. Those few players who had entered will be contacted directly and will have their entry fees refunded. Many congratulations to Eva Ressel, who has been playing in the World Youth Championships in Slovenia. all about what must have been an unforgettable experience. 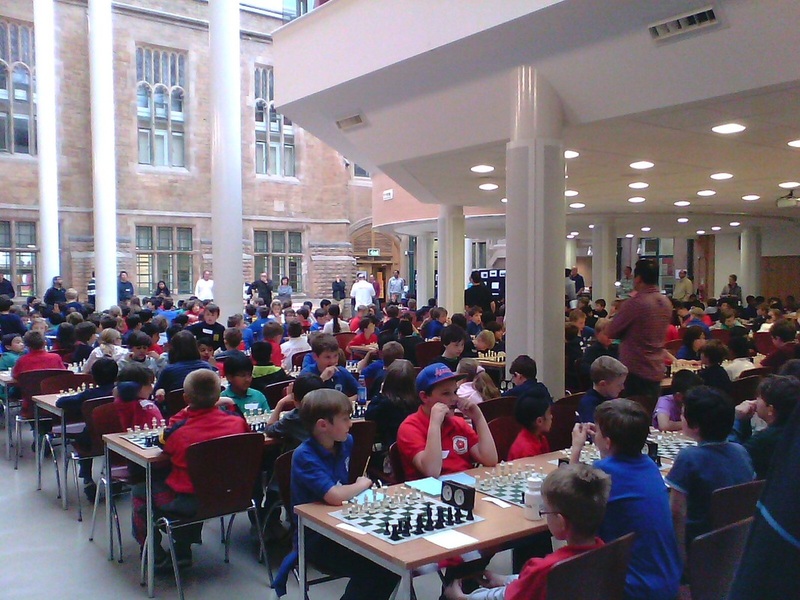 The 33rd Northamptonshire Junior Congress took place at Malcolm Arnold Academy, with well over 100 players turning up to play in various sections in their attempts to be among the best individuals and best teams in Northants, and to qualifier for the London Junior Chess Championships which take place at the end of the year. As well as a good turn out from local players, we were pleased to see so many other children entering, with some travelling down from Nottingham, and others travelling up from London. A full list of the winners can be found here. The first Grand Prix update of the season will follow shortly. The NSCA would like to wish Eva Ressel all the best as she takes her place in the England team playing in Maribor in Slovenia from November 7th to 19th to take part in this year's World Youth Chess Championships Girls Under 12 section. There are going to be players from around 90 different countries, and this is obviously going to be a very high class competition. You can "meet the team" by clicking on the following link here, and follow the progress of the competition by visiting the Championships website here. 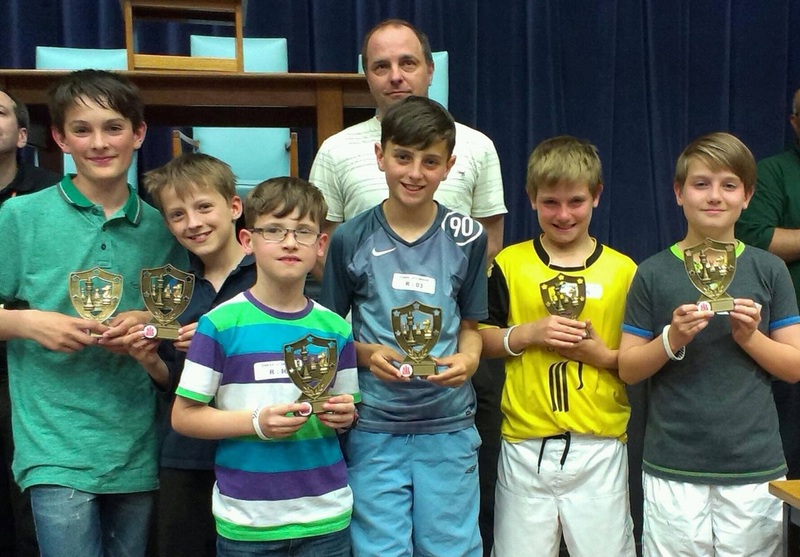 A few players again made the journey to Cambridgeshire for their Rapidplay Championships. Sam Herring won the under 140 graded prize and shared the under 15 Junior prize in the major section, scoring 3.5 out of 5, whilst Owen Robinson finished one point further back. Harry Bowman also played, taking part in the Minor section. Well done to all these players on representing Northants so well. Many congratulations to Eva Ressel for finishing joint 3rd in the Major section of the e2e4 High Wycombe Congress. Finishing on 4 out of 5 the only point Eva dropped was to the eventual joint winner, leaving her just half a point off the top. All the cross tables for all the sections can be found here. Many congratulations to Max Miller, who made the trip down to Barnet to play in their Autumn Championships....and won! He finished joint top in the under 10 section, and with that has already qualified for the major section of this year's LJCC. For the full list of winners and crosstables click here. Sam Herring and Owen Robinson followed up a previous weekend of standard play, with a Sunday of rapidplay, as they travelled to Birmingham to take part in their Intermediate section. Unfortunately they got drawn against each other in the very first round - a game which Sam won. This proved to be the difference between the two players, as Sam finished on 3 and Owen on 2. You can see all the scores in their section here. Meanwhile James Kearney played in the Minor section, scoring 2.5 - the scores for that section can be found here. Lots of county chess players had a busy last weekend of September. There was a good turn out for the first squad training of the year, which, in a change to our usual training, was taken by Chris Jones, an ex NSCA player and who now teaches chess. We hope to continue these training sessions this season by inviting the likes of Chris and other local top quality chess players and coaches to help us strengthen the squad for the coming matches. Whilst many were at the training, some players were active in competition. Eva Ressel continued her international duties with a weekend in Antwerp, where there was a quadrangular match between Germany, Belgium, The Netherlands, and England. Overall the team finished second, with Eva winning her board prize, so very well done to Eva on another top performance. Slightly closer to home three players were taking part in the Leicester Congress. The top performing of these was Sam Herring, with Marcus Rose and Owen Robinson not far behind. You can see the full results of the congress here. A number of Northants players made the journey over the border into Warwickshire to play in this event this year. The most successful of these was Sam Herring, who finished joint 5th in the Intermediate (under 145 grade) section, with a score of 4 out of 6. Owen Robinson finished just one point further back with 3 out of 6. Meanwhile, in the Minor (under 110) section, both Eva Ressel and Harry Bowman finished in joint 6th, each scoring 3.5 out of 6, the "half"s coming when they played each other in the second round! Well done to all these players. Full results and cross tables for all the sections can be found here. The Silver Plate is a new competition organised by the UK Chess Academy for those players who scored 3.5 or more in their Gigafinal, but failed to qualify for the UK Chess Challenge Terafinal. For the inaugaral competition 4 players made the trip to Oldham from Northants, so well done to Tom Calveley and Joseph Meisner who both played in the under 9 section, with Joseph scoring a very creditable 3.5 out of 6. The older sections (U17, U15 & U13) were merged together, but despite this Ryan Reed scored an excellent 4 out of 6, whilst Sam Herring missed out on winning his section by just half a point! Well done to all these players. The very next day Ryan then had to travel to Liverpool to take his place in an England team to play France - busy, busy, busy! He did very well there as well, scoring 2.5 out of 6 - many congratulations Ryan! These championships recently took place in Prague, with more than 1000 players from over 25 countries playing in the various sections. Amongst the England team was Northants player Eva Ressel, who was in the Girls Under 12 section. This involved 100 junior players of exceptionally high standards, but Eva managed to come away with three wins, so many congratulations to Eva. Reports and photos from the England team can be found here, whilst the website set up exclusively for these championships with all the final scores and results can be found here. Ethan plays at the Terafinal! Well done to Ethan Rowe for qualifying and playing in the Challengers section of this years Terafinal. By this stage of the competition the opposition is of an extremely high standard and so it was always going to be a tough weekends of chess, but Ethan got stuck in and kept going. Unfortunately Ethan was the only representative from Northants who played in the Terafinal this year. For some of the players who failed to qualify for the Terafinal however there is the new Silver Plate competition which takes place in Oldham this coming weekend on August 25th. Good luck to those who are going. The results of that competition will appear here soon, but for full details of the Terafinal weekend you can click here. The NSCA was founded 35 years ago and is one of the oldest junior chess organisations in the country. To celebrate our ‘birthday’, ex and present officials and players are invited to an afternoon of fun to be held at Ruskin Junior School on Saturday, September 15th. So, please come along to meet up with old friends, enjoy some blitz chess and partake of some barbecue fare. For all the information you can download the details here. Well done to all the Northants players who made the long trip north to this year's British Championships which took place recently in North Shields near Newcastle-upon-Tyne. During the first week in the Under 13 section Owen Robinson and Sam Herring both secured half norms by scoring 4 out of 7 - for Owen this means qualification to the England Junior Squad, so special congratulations to him on this great achievement. During the middle weekend in the Under 9 section Max Miller scored a solid 3 out of 7, and then in the Under 14 section during the second week Marcus Rose also scored 3 out of 7, whilst in the Under 12 section congratulations to Eva Ressel who finished joint top girl with a score of 4 out of 7. For all the scores and further information from the British Championships you can read lots more here.